The subject of the present sketch was born in Washington county, Pa., on July, 4th, 1842. Here he resided until 1848 when, with his parents, he moved to Morgan county, Ohio, and settled on a farm about two miles east of Eaglesport, a town on the Muskingum river. 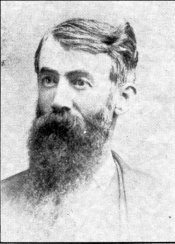 In 1859 he went to Wood county W. Va., and during the years of 1859 and 1860 attended the public schools at Parkersburg, the county seat. For a brief period he was engaged in the oil business at Burning Springs in Wirt County, W Va., and subsequently followed farm pursuits in Wood County, his old home. In 1863 he was offered and accepted employment with Mr. W. A. Cooper, a merchant at Belleville. W. Va., located on the Ohio river, and for a period clerked in his store selling dry goods, groceries and general merchandise. During his service with Mr. Cooper he was commissioned by the governor of West Virginia, second lieutenant, to recruit soldiers for the 17th regiment of West Virginia Volunteers, and succeeded in enlisting a full company composed of Ohio and West Virginia boys. He was appointed captain of Co. D., 17th regiment of West Virginia volunteers which was organized and drilled on Wheeling Island during the summer of 1864 and which was, later, assigned to the command of Major General Crook in charge, at that time, of the department of West Virginia. The war over, he came to Illinois and located at Illiopolis in March 1866. For a time he was engaged with Leon & Herbst, who conducted a general store here. and, later, became interested in farming, real estate, and fire insurance. In 1877 he was elected supervisor of Illiopolis township and discharged efficiently the duties. of the office for eight full terms, being honored, during the last four terms, by being chosen chairman of the Board of Supervisors of Sangamon County, establishing, meanwhile, a precedent for continuous succession in office. He also served for a number of years as member of the Town Council and as President of the Board of Trustees of the Village of Illiopolis. In 1870 he became a member of Illiopolis Lodge No. 521, A. F. and A. M. and has filled all the stations in said lodge from Steward to Worshipful Master. He is also a member of Kedron Chapter No. 138, R A. M., and was a charter member of Center Lodge No. 460, K. of P. and of Post No. 208. G. A.R. Mr. Peden has always taken a deep interest in Illiopolis’ progress and development, giving a willing and active support, both morally and materially, to measures and enterprises calculated to improve and better existing conditions. The new and substantial Peden block is an instance of home pride evidencing a laudable motive to give to Illiopolis a truly metropolitan appearance; and the building of a public highway along the north corporation line and the extension of Fifth street from Elizabeth street north to the boundary line intersecting at the above mentioned road, all of which improvement cost several hundred dollars and which were personally assumed by Mr. Peden, is but one of repeated instances of his pronounced public spirit. Thus the town and country on the north, hitherto reached by a circuitous route, became at once directly accessible. Mr. Peden's career is marked by enterprise, fidelity and integrity—qualities which have won and fostered popular confidence and esteem.